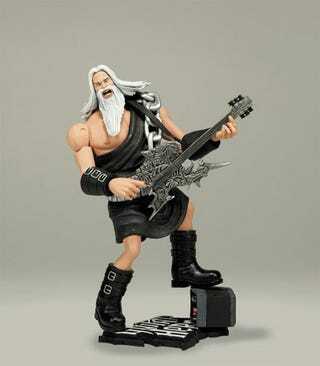 Those figures of your "favourite" Guitar Hero "characters"? They're just the start of Activision and McFarlane's push to sell you more mostly-immobile hunks of Guitar Hero-related plastic. Due for release in January 2009 will be a line of customisable guitars that let you swap out the heads, necks and bodies (no word on size or price), while later in the year, there'll be more versions of the guitars, as well as 10" versions of the already-seen characters, eight more of the 6" characters (including Clive Winston and Eddie Knox) and a few lines of 2" character figures. If you're torn between just which Johnny Napalm 10" figure you'll want - the "British Flag" variant or the "Skeleton" variant - the full release (sadly, lacking any pictures) follows.